Raleigh Edward Colston was a Confederate officer during the American Civil War (1861–1865). Born in Paris, France, Colston attended the Virginia Military Institute (1843–1846) and after graduation taught at his alma mater. In December 1859 Colston served as adjutant of the VMI detachment sent to Charles Town to supervise the hanging of John Brown. Throughout the war Colston commanded several regiments, brigades, and districts, and rose in the Confederate army from colonel to brigadier general. In June 1862, after fighting in battles at Williamsburg and Seven Pines, he contracted “Peninsular” fever, jaundice, and malaria, and was placed on leave. He recovered to fight at the battles of Chancellorsville (1863) and Petersburg (1864). Following the war, Colston lectured about his friend and former VMI colleague Thomas J. “Stonewall” Jackson, and served as principal at two North Carolina military schools. Colston moved to Egypt in 1873 to teach at a military college and lead expeditions for the Egyptian army. His poor health, however, caused him to return to the United States, where he worked as a teacher and writer at various schools until he was too ill to do so. Colston died on July 29, 1896. Colston, a Confederate army officer, was born in Paris, France, on October 31, 1825. His biological parents are unidentified, although at the end of his life, various romanticized accounts reported that he was the son of a poor French army officer or of a woman who worked as his nurse. If the latter is true, his name at birth may have been Victor Boucher. His adoptive father, Raleigh Travers Colston, was a Virginia-born physician who lived in France. His adoptive mother was Thérèse Gnudi, an Italian whose marriages to an Italian count and to François-Étienne Kellermann, one of Napoleon I’s cavalry generals, had been dissolved. Colston likely thought his adoptive parents were his birth parents until he was nearly grown. After completing his early education in Paris, he came to the United States in 1842 and lived in Berkeley County with his adoptive father’s brother, Edward Colston, a former member of the House of Representatives. Colston entered the Virginia Military Institute as a pay cadet in 1843. Attaining the rank of cadet captain, he graduated in July 1846 fourth in a class of fourteen and first in chemistry, drawing, French, and English. On August 20, 1846, in Lexington, Colston married the twice-widowed Louisa Meriwether Bowyer Brown Gardner. They had three daughters, one of whom died as a child. Following his graduation, he became an assistant professor of French at VMI; he also taught military history and strategy, modern history, and political economy; and served as the school’s treasurer. During the 1840s, Colston wrote and published a forty-nine-page pamphlet entitled The Problem of Free Society, about the working class in Great Britain. By 1854 he had become the first graduate of VMI to reach the standing of full professor at the institute. In December 1859, Colston served as adjutant of a VMI detachment sent to Charles Town for the hanging of John Brown. After Virginia seceded from the Union, the governor appointed Colston as a colonel in the Provisional Army of Virginia on May 2, 1861. He was assigned to duty in Norfolk and given command of the Twenty-sixth Virginia Infantry Regiment, a unit redesigned as the Sixteenth Virginia Infantry Regiment when it mustered into Confederate service on July 1 of that year. Colston remained in command of the regiment until he was promoted to brigadier general on December 24, 1861, although the Confederate States Senate did not confirm his appointment until February 19, 1864. Along with Colston’s promotion came an assignment to command the First Brigade, Department of Norfolk, from January to April 1862, when his brigade was transferred to the peninsula to reinforce the Yorktown line. Colston commanded a brigade under Major General James Longstreet during battles at Williamsburg and Seven Pines. In June 1862 he contracted “Peninsular” fever, jaundice, and malaria and was placed on leave. 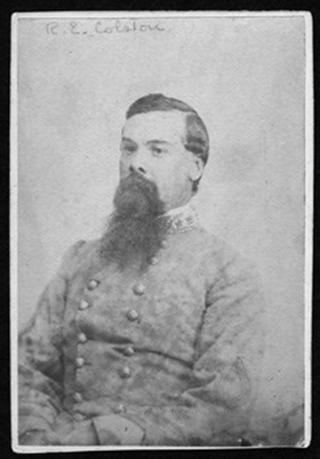 Colston did not return to duty until December, when he received command of a brigade of Virginia units in the Petersburg-Blackwater District. After several months he took command of the entire district. After serving temporarily in Major General George E. Pickett’s division, Colston on April 4, 1863, took command of a brigade in Lt. Gen. Thomas J. “Stonewall” Jackson’s corps. With Major General Isaac Ridgeway Trimble absent because of illness, temporary command of his division devolved to Colston during the battle of Chancellorsville. He returned to his own brigade shortly afterward. General Robert E. Lee relieved Colston of brigade command on May 28, 1863, ostensibly because soldiers in two North Carolina regiments objected to being commanded by a Virginian, but more likely because he had moved Trimble’s division into position too slowly on the second day at Chancellorsville. Colston was assigned to attend examinations at VMI. Denied other requested military assignments at least five times during the next several months, he remained in Lexington until ordered on September 21, 1863, to report for temporary duty in the Department of South Carolina, Georgia, and Florida. Assigned to the District of Georgia on October 17, 1863, Colston was given command of a brigade in Savannah and defenses on Saint Augustine Creek. He was relieved on April 16, 1864. After accepting a colonel’s commission from the khedive of Egypt, Colston arrived in Cairo in the spring of 1873. Although originally recruited to teach geology at an Egyptian military college, he became an explorer for the Egyptian army and conducted topographical, botanical, and geological expeditions. During the winter of 1873–1874, Colston took part in a surveying mission to Bernice on the Red Sea. Beginning in December 1874 he helped lead the first phase of a two-year scientific survey expedition from Cairo to central Africa, where he contracted a debilitating and unexplained illness that caused him great pain, rheumatism, and paralysis. Although a doctor advised him to return to Cairo, Colston refused to abandon the expedition and remained in command until September 1875. For his services the khedive inducted him into the Osmanie Order of the Ottoman Empire. Colston returned to the United States late in 1878 but lost his savings through poor investments. To earn income he gave lectures and wrote articles on his Egyptian experiences. He unsuccessfully sought appointment to the faculty of the Virginia Agricultural and Mechanical College (later Virginia Polytechnic Institute and State University), and in 1881 he served as commandant at a New York military academy. Colston enlisted the support of several former Union and Confederate generals, including US Senator William Mahone, in securing permanent employment. In August 1882, while living in Petersburg, he received an appointment as a clerk and translator with the War Department and moved to Washington, DC. Colston’s wife died on November 13, 1882, in Raleigh, North Carolina, after years of mental illness. On June 27, 1883, in Washington, DC, he married Laura Eunice Collier Mitchell, a widow. They soon separated; she charged Colston with desertion, and they divorced on May 1, 1889. Colston translated a French novel published in New York under the title A Tragedy in the Imperial Harem at Constantinople (1883) and later reissued as A Tragedy at Constantinople (1888). He also wrote The War in the Soudan for the Rescue of “Chinese Gordon” (1885) for the American Geographical Society. Colston was ill constantly and even tried fasting for several weeks in December 1886 to relieve his condition. The Confederate Veterans’ Association of Washington and the Ladies’ Southern Aid Society helped to take care of him physically, while friends supported him financially. By 1891 he was confined to his home, but he continued at least nominally to work for the War Department until he was dismissed in the spring of 1894. In September 1894, Colston entered the R. E. Lee Camp Confederate Soldiers’ Home, in Richmond. Paralyzed from the waist down, he gradually lost the use of his hands as well. Raleigh Edward Colston died at the soldiers’ home on July 29, 1896, and was buried in Hollywood Cemetery. Streets in Lexington and Petersburg bear his name. Sources of information: Harter, Dale F. and the Dictionary of Virginia Biography. "Raleigh Edward Colston (1825-1896)." Encyclopedia Virginia, Sara Bearss and Caitlin Newman, January 27, 2013. Virginia Foundation for the Humanities, July 18, 2012.